Yesterday morning my twitter and mailbox exploded – I got an email from Mark Brunstad, who is the VCDX Program Manager that I have achieved the VCDX-Cloud Credential and that I am the first person to do so. Mark as a good PR person informed the whole internet about it so congratulations started coming from everywhere. I would like to thank you all with this blog post and also describe how difficult (or easy) the journey has been. What should be mentioned first that I work at VMware Professional Services as an architect and that VCDX certifications very well align with what I do for my job. This is very important as I can take experiences, knowledge gained and designs from my customer engagements and apply them in the steps needed to gain the certification. I can imagine that for someone who wants to become VCDX and works in pre-sales, admin or manager role it is much harder as he will need to do a lot of stuff beyond his regular job. I used to be project manager and I know how hard it was to get my first VCP. As I passed my VCDX 5 – Data Center Virtualization last year in Barcelona my path to VCDX-Cloud was much easier as can be seen from this picture taken from VMware Certification website. I just had to pass both cloud VCAP exams (CIA and CID) and submit application and design, but did not need to defend it. In order to prepare panels for VCDX-Cloud defenses for VMWorlds in San Francisco and Barcelona, VMware internally organised bootstrap review which gave me the opportunity to become the first VCDX-Cloud certification holder. I took beta exams for both VCAP-CID and CIA and blogged about them here and here. The VCAP – Cloud Infrastructure Design was the hardest one I ever took and also because I did not allocate enough time for it I had to leave the exam room early before finishing half of the ‘Visio’ design tasks and failed it. So I had to take it again when it was GA and again had hard time with it as I expected vCloud Director 5.1 questions and it was still based on 1.5 version. Anyway I passed it. The VCAP – Cloud Infrastructure Administration was also not easy as it is hands on exam on real environment in USA with high latency (I am in Europe). After getting both cloud VCAPs I had to just wait for the release of VCDX-Cloud blueprint and application. 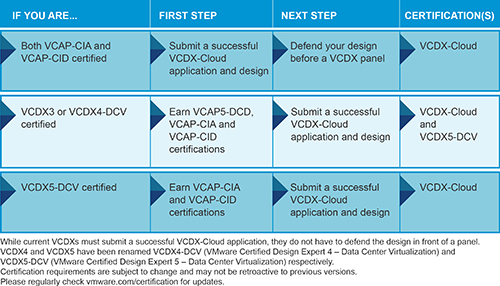 It is actually possible to use the same design for VCDX-DCV and VCDX-Cloud certifications (obviously as long as it covers objectives of both certifications). My Barcelona VCDX-DCV design was actually based on vCloud Director 1.5 public provider project so I could just use the same one. I thought that it would be too easy so I actually did not do it and instead sent an updated design for vCloud Director 5.1. Although I could reuse many materials from the customer engagement (like Operational Guides) I still spent significant time rewriting and polishing the design. The point is that the design is supposed to show your skills, choosing simple (small) project is possible however it might not give enough opportunity to show advanced skills and then the scoring will be low. The scored areas are specified in the blueprint – my advise is don’t just cover them but try to go extra mile (be innovative, do not use just out of the box features, etc. – example could be Fast Provisioning with VAAI, scripting, VXLAN, disaster recovery, etc.). BTW my main design document had 160 pages. And that was it. No defense necessary. I was actually kind of sad as the defense in front of the live panel is the most adrenaline and most fun of the whole journey (who likes sitting 4 hour Pearson Vue exams, or polishing Word document for 10th time, …). My hope is now to become the VCDX Cloud panelist in Barcelona 2013 and meeting some of you there. 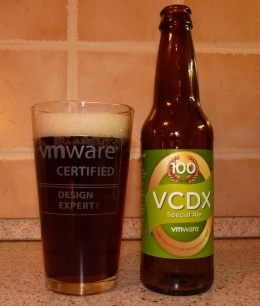 Endnote: No I am not going after VCDX-DT – someone else can be the first triple X. Great advice from a true Cloud Warrior – note the choice of avatar! This actually is a big deal. Congratulations.